Tanaka Farms is one of my favorite places in Orange County - not only is their pumpkin patch the best (they actually grow their own pumpkins), but they also host the fantastic Plant Fest every season featuring a fun assortment of vegan food and vendors (see past visits to their pumpkin patch and Plant Fests HERE!). Not only that, but they have pick-your-own veggies and fruits and farm tours as well. 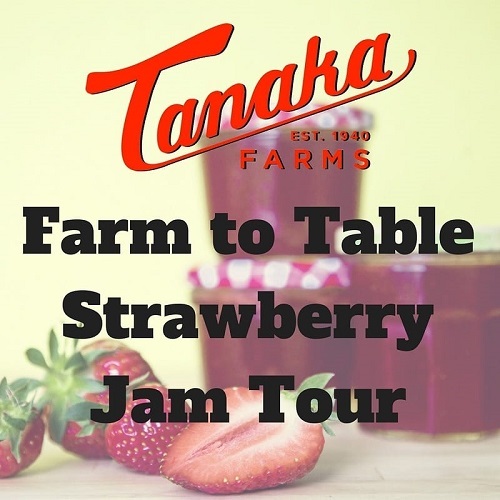 For the next two Thursdays and Fridays, they will be hosting Farm to Table Strawberry Jam Tours! Tanaka Farms has some ripe, juicy, and delicious late-season strawberries waiting to be picked! This tour will include a wagon ride out to the strawberry fields, where you can enjoy the sunshine and pick berries. After choosing the sweetest strawberries, you'll head back to the farm where you will learn how to the berries into a delicious strawberry freezer jam! At the end of your strawberry jam-making adventures, you'll get to take home a jar of jam along with a basket of luscious, sun-kissed strawberries. The tours will be held this Thursday, July 19th and Friday, July 20th, as well as next Thursday, July 26th and Friday, July 27th. All tours start at 10:30 AM and are $18 per person. To RSVP for the event and buy tickets, visit the Facebook event page!